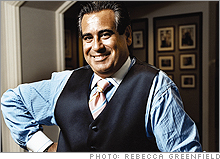 Joseph Ancona, an Italian immigrant, shears some of the business world's most powerful heads. You won't believe what it costs, writes Fortune's Jennifer Reingold. (Fortune Magazine) -- Private jets and private chefs are de rigueur for business's power elite. So, too, you'd think, would be private coiffeurs, paid handsomely to make sure a comb-over does what it's supposed to. Instead, some of the biggest titans of industry - Rupert Murdoch, Carl Icahn, and James Kilts among them - traipse regularly to Salon Fodera in the basement of New York City's St. Regis Hotel for a $65 trim by a Sicilian immigrant named Joseph Ancona. Rupert Murdoch and Carl Icahn are regulars in Ancona's chair. Usually gets a trim - sometimes a manicure. "He doesn't like spray," Ancona says. Visits every few weeks for "a little trim"; when late, very apologetic. Lost a bet and shaved his head. "We're waiting for it to grow back." When in town, comes in daily for a wash and blow-dry. "I love him for that," says Ancona. "Somehow they relax in my chair," he says. The salon isn't much to look at, with its fluorescent lights and 25-year-old chairs. But Ancona's clients don't seem to care. They like the way he can accommodate them on short notice, at 7:30 A.M. or 8 P.M. - and appreciate his sink-side manner as much as they do his skill with scissors. Other clients like that they can trust Ancona, 53, as a friend, no easy task for most people in the business of servicing big shots. "He makes you feel like the only guy in the world," says John Layfield, a former professional wrestler turned investment banker. Ancona says he gets away with blunt honesty. "I'm able to tell them things nobody else dares to tell them, and they love it," he says, noting the time he told Carl Icahn his tie knot was all wrong - and retied it for him. As for Murdoch, the News Corp. (Charts, Fortune 500) chairman first happened into the salon more than a decade ago while staying at the St. Regis, says Ancona, and now stops in for a trim every two weeks when he's in town. "He's a gentleman," Ancona says; while Murdoch is sometimes a little tardy, Ancona says he always apologizes profusely. "Every time, I see him in the corridor, running," he says. Icahn, meanwhile, usually gets a trim, often with a manicure. "He likes the clean, basic look," Ancona says. "He doesn't like spray." Of course, smoothing the locks of business titans is a bit more challenging than servicing your average customer. Many of Ancona's clients, such as Murdoch, have multiple residences, which means multiple stylists. "Every time he comes I try to repair the work that [competitors] do," Ancona says. But Murdoch made certain to be there last December when 18 clients got together to present Ancona with a token of their appreciation, a $50,000 fund for his two sons' college tuition. Ancona had no clue what was coming when two regulars - Dan O'Connell, the founder of Vestar Capital Partners, and financier Ray Chambers - invited him upstairs for a Christmas drink. When he arrived, a group of regulars - Murdoch included - were there to fete him with champagne and present him with his gift. "It was the best tip I ever got," he says. One well-known head Ancona decidedly doesn't style is Donald Trump. But that doesn't stop him from offering up a few thoughts on the Donald's do. "His part starts here," he says, motioning to his right ear, "then goes back, comes forward, and goes back again. His hair must reach his chest, that's how long it is." Why would he do that? we wonder. "Because he's bald, that's why," says Ancona. His solution: "A nice hairpiece."